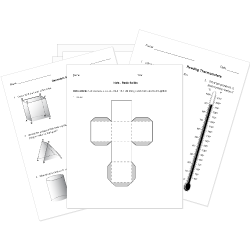 You can create printable tests and worksheets from these Grade 3 Calendar Math questions! Select one or more questions using the checkboxes above each question. Then click the add selected questions to a test button before moving to another page. 3 months and 1 week. 2 months and 2 weeks. Which of the following is about equal to 26 weeks? The Kosko family are going on a 5 day vacation. If the family leaves on Tuesday, what day of the week will they return? Which of the following is the longest period of time? Zoey's birthday is June 8, 2006. Ryan's birthday is June 8, 2005. Which statement about Zoey and Ryan's ages is true? Zoey is 1 month older than Ryan. Ryan is 1 month older than Zoey. Zoey is 1 year older than Ryan. Ryan is 1 year older than Zoey. How many years is a century? Saul's birthday is on the 31st day of the month. Which of the following could be the date of Saul's birthday? Avi's great-grandmother just celebrated her 100th birthday. She has been alive for a . In what season do the flowers start to grow?